We were excited that Reaktor 5.5 (beta) was announced and decided to go ahead and create a new freebie to celebrate the release. Sineblaster is a brand new synth for Native Instruments Reaktor 5.5 (beta), that makes use of the brand new Sinebank module. 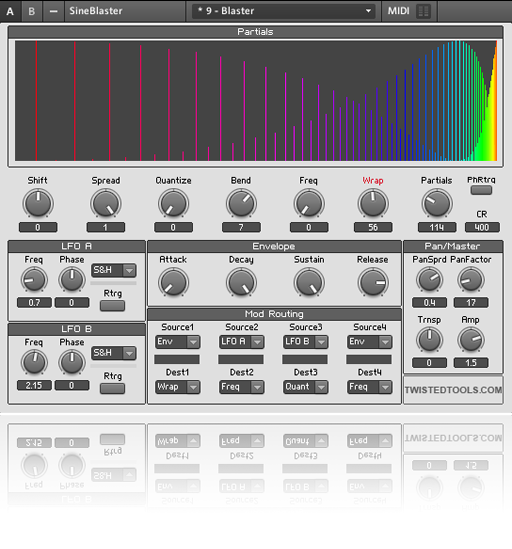 Sineblaster is an additive synth with a extensive modulation over sound particles and includes an elegant visualizer. It has also has two LFOs, a mod matrix, unique pan/spread controls. Enjoy it and please share it with the world! Please note that this device is built specifically for Reaktor 5.5 and will not work with previous versions of Reaktor. Sineblaster is a monophonic additive synthesizer based on a groundbreaking SineBank module that comes with the new Reaktor 5.5. At the core of this synth is a flexible partial modulator, giving the possibility to apply complex morphing for up to 384 sine particles at the same time. In addition there is a straightforward modulation matrix and spectral stereo spread for extra goodness. Made something using Allgorhythm? Leave us something using our dropbox in our community area and vote for the best submission in our forums. Winner takes home a Twisted Tools T-shirt of their choice.